For the first time, ISRO invited common people to view the launch. With this, India became the 4th largest space power in the world. Till now, only three countries in the world – United States of America, Russia and China have achieved this. Generally, after the launch mission is over, the rocket engine is left discarded as space debris. However, the ISRO has now started a new trend by using the engine for experiments. Following the launches, the fourth stage of the PSLV-C45 rocket will be brought down further to 485 km and will be used as a platform for different experiments by Indian institutions including ISRO. It will be turned into a payload platform carrying three experimental payloads. This will be the second time in a series that ISRO will use the launch rocket for experiments. Earlier in the last PSLV mission also, it adopted the same innovative method. The merger of Bank of Baroda, Vijaya Bank, and Dena Bank became effective on April 1, 2019, marking the first-ever three-way merger in India's banking sector. The power of 3 banks will create a contemporary banking entity with an ability to do more and reach further to fulfil customers with world class offerings backed by robust processes. The merger of these three state-owned banks is a part of the government's agenda of consolidation of public sector banks. The amalgamation would be carried out under Alternative Mechanism. Finance Minister Arun Jaitley, who heads Alternative Mechanism, assured capital support to the merged entity. Other members of Alternative Mechanism included Railway Minister Piyush Goyal and Defence Minister Nirmala Sitharaman. • Vijaya Bank and Dena Bank are the Transferor Banks and the Bank of Baroda is the Transferee Bank. Who are Transferor and Transferee? Transferor is the party making a transfer to another party as part of a legal arrangement. Transferee is the party who receives the funds and assets or the benefits of a letter of credit by action of a transfer. • The undertakings of the transferor banks will be transferred to the transferee bank, including all business, assets, rights, titles, claims, licenses, approvals and all property, all borrowings, liabilities and obligations. • Every permanent and regular officer or employee of the transferor banks will become an officer or employee of the transferee bank. • The pay and allowances offered to the employees of transferor banks shall not be less favourable as compared to what they are drawing in their respective transferor bank. • The Board of the transferee bank, that is Bank of Baroda, will ensure that the interests of all transferring employees and officers of the transferor bank are protected. • The transferee bank will issue shares to the shareholders of transferor banks as per share exchange ratio. • Shareholders of the transferee bank and transferor banks shall be entitled to raise their grievances, if any, in relation to the share exchange ratio, through an expert committee. All these strengths of the three banks will translate into advantages in terms of market reach, operational efficiencies and the ability to support a wider offering of product and services. • The amalgamated bank will be better equipped to meet the credit needs of a growing economy, absorb shocks and capacity to raise resources. • It would enable creation of a bank with scale comparable to global banks and capable of competing effectively in India and globally. • The amalgamated bank will have access to a wider talent pool, and a large database that may be controlled through analytics for competitive advantage in a rapidly digitalising banking context. • Public will be benefitted in terms of enhanced access to banking services through a stronger network and easy access to credit. The amalgamation will help create a globally competitive bank with economies of scale and enable realisation of wide-ranging synergies. Leveraging of networks, low-cost deposits and subsidiaries of the three banks has the potential of yielding significant synergies for positioning the consolidated entity for substantial rise in customer base, market reach, operational efficiency, and improved access for customers. How these three banks will add value to each other? Dena Bank, with gross NPA ratio of 22 percent, is currently under the Prompt Corrective Action (PCA) framework and has been restrained from further lending. Dena bank would no longer be covered under PCA after amalgamation. Vijaya Bank is among the better performing public sector banks with a gross NPA ratio of 6.9 percent. The Bank of Baroda has a bad loan ratio of 12.4 percent. 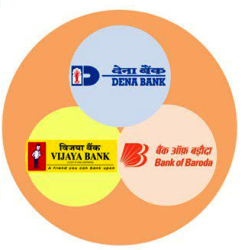 The Bank of Baroda has a wide spread network, while Dena Bank and Vijaya Bank are more regionally focused. The Global network strength of Bank of Baroda will be leveraged to enable customers of Dena Bank and Vijaya Bank to have global access. Dena Bank’s strength in the Micro, Small and Medium Enterprises (MSME) will further augment the strength of the other two banks to position the amalgamated bank for being an MSME Udyamimitra. Merged entity will benefit from Bank of Baroda’s high Capital Adequacy Ratio; Vijaya Bank’s strong asset quality position; and Dena Bank’s strong CASA (Current Account Savings Account) base.